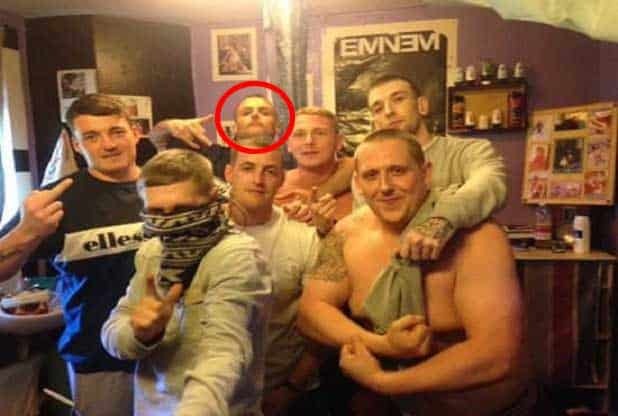 A prolific burglar who appeared in an infamous set of prison selfies boasting about the cushy regime inside is back behind bars – after reoffending when he was released. Simon Inker, 42, starred in a series of Instagram pictures taken on a smuggled camera showing inmates using PlayStations, cooking steaks and taking drugs. He had been released on licence by the time the scandal broke in November and had returned to his life of crime, committing a string of burglaries across Bristol. Police launched a manhunt for him in December after he breached the terms of his licence and failed to answer a recall to prison. But he had in fact gone AWOL and was committing more burglaries. He has now been jailed for four more years after he admitted burgling a house in Fishponds, Bristol, in November where he stole a laptop and cash. Inker also asked Bristol Crown Court to take 12 other offences into consideration, including four counts of trespassing with intent to steal and eight burglaries. These took place mainly in November and December, with one in July, despite a warrant being out for his arrest. Items including cash, jewellery, watches, electrical items and a bike were stolen from homes in the Bradley Stoke, Brislington, Greenbank, St George and Stoke Gifford areas of Bristol. He was eventually arrested after a member of the public spotted a man acting suspiciously in Bradley Stoke, called police and officers found him. During his crime spree the selfies taken at Guy’s Marsh Prison in Dorset emerged, which eventually sparked a Home Office inquiry. Despite being wanted by police, he contacted the Bristol Post newspaper to insist the regime was not as cushy as it appeared in the snaps. “It is a lot different from what you’ve got written down, with all the stuff about takeaways and steaks,” he told the paper. “You seem to think it’s a cushy life in prison, but how about the deaths? “They are so short-staffed, people are looking left, right and centre. “People are dying in their cells. We’ve witnessed people getting hanged. Inker said reports suggesting an easy life behind bars were simply wrong and blown out of all proportion. He said: “I was there. I was in prison. The truth is, everyone is walking on eggshells, especially the inmates. “You are meant to have offender behaviour programmes, prison is meant to change people so they can be a positive member of society. “All that’s happening at the moment is you go in, you serve your time and you come out because the Home Office has peeled back every single penny. “It’s not assisting offenders. It’s all about saving money,” he added.